With the inaugural event in June 2019, RISE has developed an innovative approach to identifying, developing and nurturing cycling talent in athletes of all ages and from all athletic disciplines. Our overarching goal is to help these athletes become cyclists for life, and to help them achieve their personal cycling goals through the development of life skills, creation of a collaborative network of cycling experts, and improve athletic performance on the bike. This is their inaugural event, yes the first time they have done this. 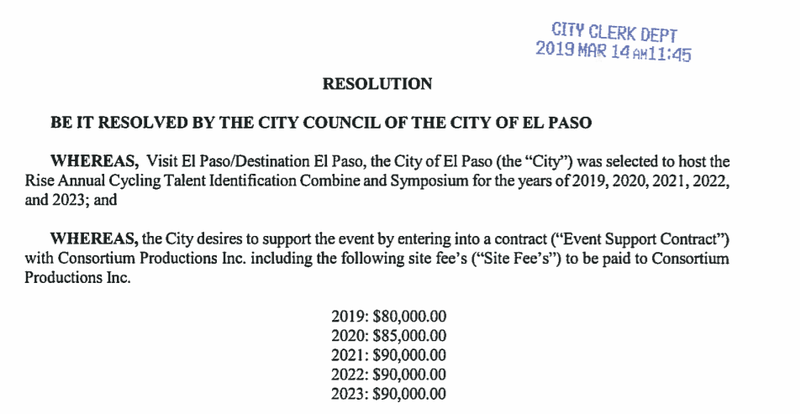 Evidently wanting to get in on a good thing the city is promising to pay the group $435,000 and to host the event for five years. This might turn out to be a good thing but no one knows for certain. In particular we don’t know if we will want the company or the participants to come back after the first year. By the way the city promised to do this back in November we are only learning about the money this week. The Times published an editorial the other day that I agreed with. The Texas Court of Criminal Appeals evidently invalidated the portion of the Texas Open Meetings Act that specified criminal penalties for members of government boards that arrange meetings with less than a quorum in order to avoid the requirement to make the meeting open to the public. The Times editorial told us that our Texas Governor has written a letter to state board appointees and state agency chiefs telling them to “continue to follow the spirit” of the Texas Open Meetings Act without regard to the appeals court ruling. Unfortunately our local governments are now free to meet in private and discuss public business as long as they do not have a quorum present. We hope that our Texas legislature will take action soon to shore up the Open Meetings Act. It seems that Las Palmas hospital and the residents of the Rim road area have come to a settlement. The city issued building permits that allowed Las Palmas to build a $67 million dollar facility. After the facility was built the city refused to issue certificates of occupancy because of a parking capacity problem. The permits should not have been issued but they were. Many prominent residents of the Rim road area objected to allowing the building to be opened without additional parking being provided. The hospital was stuck with a brand new expensive building that it could not open. The paragraph below comes from a document proposing a settlement between the hospital and the neighborhood association. Word on the street is that Las Palmas had to cough up some part of the $653,500 in order to get the residents to drop their objections. At that point parking capacity was evidently no longer a problem. The issue sailed through city council without mention of the financial settlement. If granting a parking variance made sense it should have been granted without city council helping the neighborhood association to extract the extra money. The way I see it city council helped the neighborhood to extort the money from Las Palmas. Shame on them. Word will get around. Companies thinking about coming to El Paso will wonder what the city will do to them. Several of the local media outlets told us the other day “ballpark debt to be paid by 2021”. What they should have told us is that the city thinks that the taxpayer funded subsidy currently necessary to pay the debt service might not be necessary in order to pay the debt service costs after 2021. The city says that they believe that the combination of hotel occupancy taxes dedicated to the project and sales tax revenues generated from within the ball park will be adequate to cover the debt service costs after 2021. The latest projection that we have been able to find from the city indicates that they will use hotel occupancy taxes and sales tax revenues to pay the mortgage until 2043. –Dee Margo, Chair of the Ad Hoc Bond Committee, El Paso Times, April 2, 2000. The City of El Paso was awarded $100,000 in grant funding to use towards extending resources to our minority business population via programs that are easily accessible to the public. We hope to remove barriers of access to important resources such as capital, contracts, markets, and strategic business consulting services. We look to enhance economic and educational opportunities for the public via local resource partners, multiple City of El Paso Departments, and The El Paso Public Library System, which is another support pillar within the business ecosystem and for minorities. The results of this survey will be used to gather baseline data for the City Accelerator project. The City Accelerator project is aimed at improving local job growth for minority and disadvantaged small business owners and entrepreneurs in all employment and business sectors. If you have any questions, please feel free to reach out to Aimee Olivas, Business Retention and Expansion Specialist at OlivasAP@elpasotexas.gov. Your participation, highlighted by this survey, is appreciated and will ensure we address the needs of our minority small business owners and entrepreneurs in the El Paso Region. Take a moment and look at the survey. Would you give them this level of information? Would you like to know what the city’s interim financial statements look like? 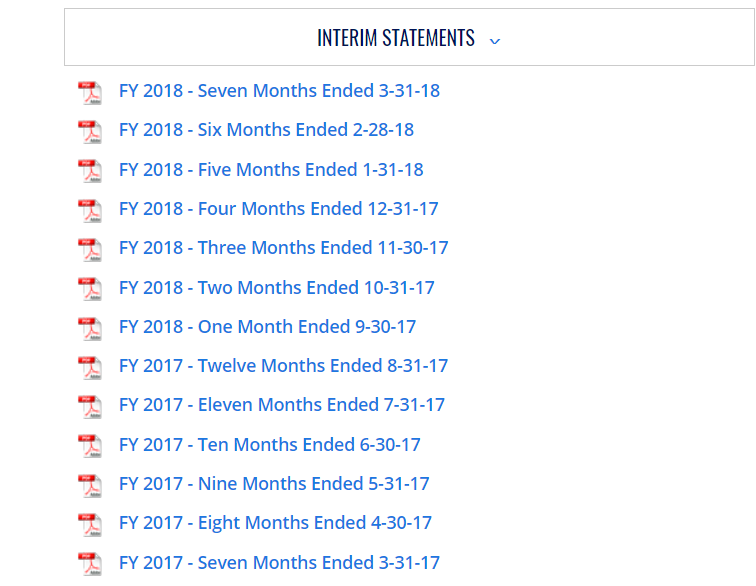 While they used to post a report each month it looks like they have not done so for almost a year.